First of all I am a HUGE fan of ANTHROPOLOGIE ! I was the luckiest girl to work with Glen Senk years ago when I worked at a PR / Architect agency. It was an amazing experience because he is not only a GENIUS and SUPER TALENTED but he is one of the nicest people I have ever met. I was lucky to work closely with the home office in Philadelphia – I launched stores across the country, handled some awesome events including getting an awesome tap dancer to tap her way through the SoHo store to handling all their press previews and product launches. It was definitely one of my favorite accounts EVER! I have a special place in my heart and I am a Anthropologie Shopaholic – I have tons of it at my apartment and knew for the studio launch there needed to be ANTHROPOLOGIE inclusions. 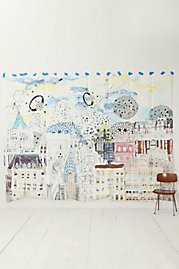 Anthropologie sells the most amazing show stopping WALLPAPER – like everything this section of their store is well curated – you can mainly find them online – http://www.anthropologie.com. 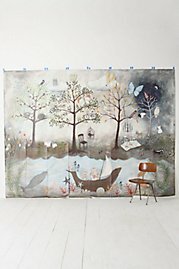 They are not just wallpaper they are special works of art that are sweet and tone setting. The wallpaper in the washroom is from ANTHROPOLOGIE and everyone that sees it – flips out ! It was the first thing I purchased for the studio before the desks, tables, lights – I knew I needed this wallpaper. Then when we were about getting done with the first wave of the studio I really thought this wall needed something and I looked back to Anthropologie and I found the most amazing wallpaper which is now an amazing backdrop for photos – everyone loved it at our party. Thank you to Anthropologie for curating amazing product and WALLPAPER and being so kind to send me the wallpaper for the studio. This is a very special part of the studio and I thank you for everything you did to get this to me! I am forever an ANTHROPOLOGIE FAN! Thank you Joannah for all your help – you are AWESOME !